The North Burial Ground dates from 1700 and is the largest municipal cemetery in the region at 109 acres with more than 35,000 gravestones. The cemetery is owned and operated by the Parks Department and it contains an eclectic collection of funerary sculpture ranging from simple slate markers to elaborate mausoleum structures. The North Burial Ground is rich in local history with many notable Rhode Island governors, mayors, Civil War and Revolutionary War leaders and some of Providence’s most prominent citizens buried there. John & Nicholas Brown, Steven Hopkins, Horace Mann, Nicholas Cooke, Gregory & Ebenezer Dexter and Samuel Bridgham are just a few of the graves of interest. Canonicus, the Narragansett Sachem, who sold Roger Williams the land that is now Providence, is also memorialized at the North Burial Ground. A map of notable graves and memorials is available at the North Burial Ground office for a walking tour. The many windy roads and rolling topography makes the North Burial an ideal walking or jogging site. An active cemetery, about 225 burials a year take place at North Burial Ground. 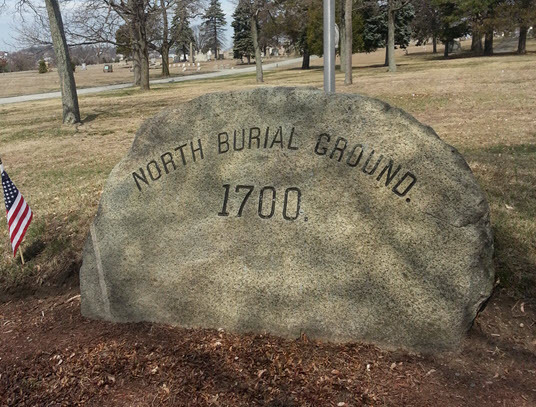 For more information about buying a plot or burials, please call the North Burial Ground office at 401-680-5318. The North Burial Ground is open to the public seven days a week from 8:00 am-4:00 pm. Office hours are Monday-Friday, 8:00 am to 4:00 pm. The North Burial Ground is an active public cemetery. As such, burials and perpetual care are our priority. We do, however, accommodate requests for genealogy research as our staffing and capacity allow. Our genealogy specialist is in the office once a week. We ask for your patience processing your request as turnaround time is usually 2-4 weeks.